Orile Agege area of Lagos was rocked by an explosion that left 2 injured and destroyed properties worth several millions of naira, petfadblog.com reports. 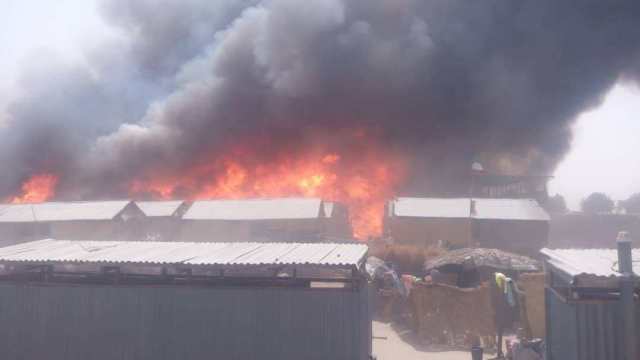 Residents of the area said the explosion which jolted a lot from sleep was caused when an high tension wire landed on the roof of a house which had a cooking gas in it. I COULD NOT SALVAGE ANYTHING FROM THE FIRE. THE MOST PAINFUL ASPECT IS THAT THE MONEY I WAS SUPPOSED TO PAY INTO THE BANK YESTERDAY (MONDAY), ON BEHALF OF MY COMPANY, GOT BURNT. I COULD NOT PAY BECAUSE THE BANK HAD CLOSED. MY INTENTION WAS TO PAY IT IN TODAY(YESTERDAY), ONLY FOR THE UNTHINKABLE TO HAPPEN.